Another PhD from the department! David Wiedmer has publicly defended his doctoral dissertation TiO2 dark catalysis in biomedical applications. Department of Biomaterials congratulates David on his great achievement! 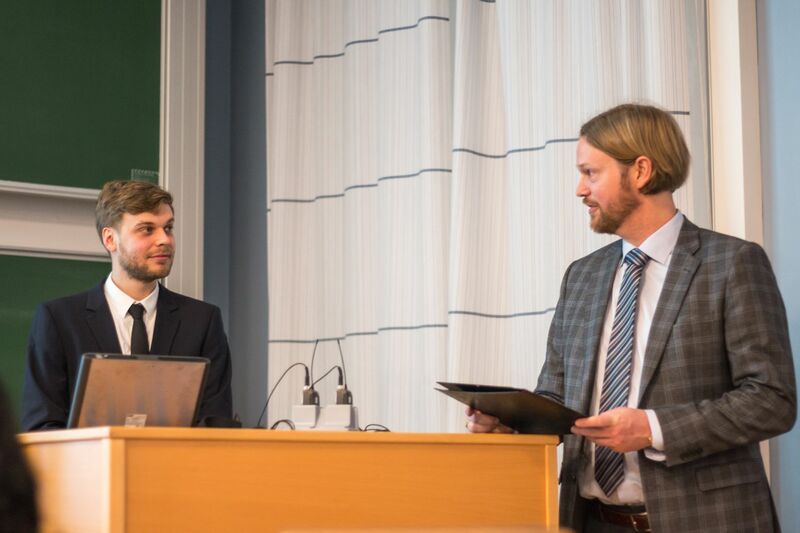 David Wiedmer defended his PhD thesis in style throughout the extremely knowledgeable opposition from his evaluation committee Henny C van der Mei, Pentti Tengvall, and Odd Carsten Koldsland (from left to right). Photo by Margit Selsjord / UiO. Titanium (Ti) and titanium dioxide (TiO2) are well-recognised biomaterials for implants that require bone tissue integration. The formation of a direct anchorage between the biomaterial surface and the host tissue is essential for the long-term stability of the implant. This implant-tissue interface is challenged in the presence of bacteria, and therefore, antibacterial strategies are needed prevent and control biomaterial associated infections. In this thesis, the potential of TiO2 dark catalysis as a strategy to combat these infections was assessed. The dark catalytic of TiO2 describes the formation of highly reactive free radicals in the absence of irradiation, and thereby, expands the field of application of classical TiO2 photocatalysis. So far, TiO2 dark catalysis is not well characterised. The work of this thesis aimed at deeper understanding of the chemical reaction leading to the formation of radicals. Since these radicals are known to possess strong antibacterial properties, the potential of TiO2 dark catalysis in two biomedical applications was assessed: the treatment of an existing infection and the prevention of infection by a novel surface modification. TiO2 dark catalysis showed antibacterial activity in both targeted applications and is a promising approach to fight biomaterial associated infections. Read more about David's PhD project in English or på norsk. All photos by Florian Weber unless otherwise noted.